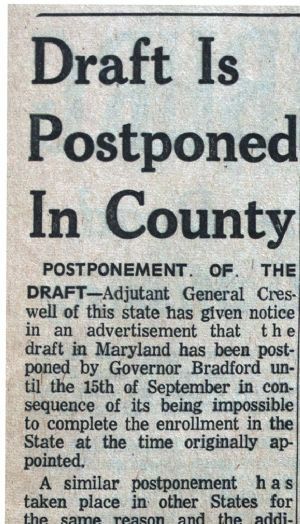 Adjutant General Creswell of this state has given notice in an advertisement that the draft in Maryland has been postponed by Governor Bradford until the 15th of September in consequence of its being impossible to complete the enrollment in the State at the time originally appointed. A similar postponement has taken place in other States for the same reason and the additional one that it is expected that the quotas may be raised in a number of these states. Maryland must also raise her quota by volunteering or by drafting. It may be supposed by some foolish persons that because the draft has been postponed, it will not take place at all, but let no man lay this flattering unction to his soul. The Draft will come, if the State’s quota under both calls of the President is not furnished by the voluntary enlistments of the patriotic citizens on or before the time specified by the Governor, the 15th of the present month. Fall in, then, men of Washington County, and let us endeavor, in addition to the three companies which have already left this county, to raise a fourth and a fifth for the support of our Government and the defense of our homes and firesides. No time is to be lost. We understand that the enrollers of the militia in the county have been busily engaged in the discharge of their duties, during the past week, and have generally completed their labors. Messrs. Thornburg and Wise, the enrollers for Hagerstown, are done, and we learn have reported about nine hundred names, or about one hundred and forty less than the voting population of the district. This includes the volunteers who have left the district as well as persons who will claim exemption on account of physical disability and on various other grounds which will very materially contribute to reduce the number liable to military duty upon whom the Draft will essentially be made. Henry Tritch, the enroller of the Funkstown District, completed his work and made his report on Saturday, Aug. 30. He reports three hundred and sixteen men between the ages of eighteen and forty-five. Of these, 27 are volunteers in the Union Army; six are in the Rebel army; three are imprisoned at Fort McHenry; and two have skedaddled. The voting population of the district is about 335 or 340. Col. Isaac Nesbitt has been appointed Commissioner of Enrollment and Draft for the County, and Dr. Frederick B. Dorsey examining surgeon. Both gentlemen have entered upon the discharge of their duties and will no doubt have a busy time for the next eight or ten days with the real and bogus cripples of the county. Herald & Torch).